It would be wrong for me to recommend for the first time visitors in Japan some unknown temple or shrine, located far from the main routes. During your first visit you should go to famous places, because there are so many great things to see in the so called “tourist areas". But if Japan already captured your heart and if you want to enjoy more of what Japan has to offer, I will tell you that you can have delightful experiences and see some amazing places by just exploring the neighborhoods. Here’s one of these places, a small temple I discovered a couple of years ago and to which I managed to return this month. It is located in Ueno, Matsugaya (somewhere behind the Oak Hotel, a quite well-known hotel for backpackers). 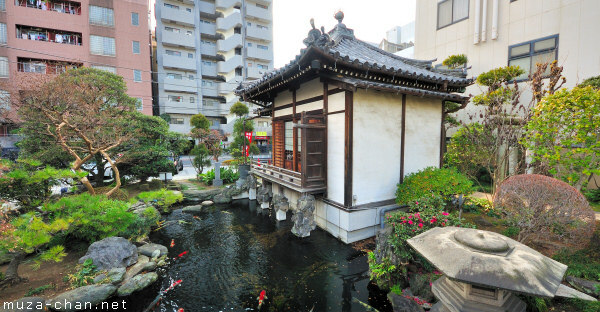 It’s a small place of astonishing beauty, with a little Japanese garden, a pond with a lot of hungry Japanese koi and beautiful stone lanterns… Isn’t it a shard of paradise?